Beat eggs in medium bowl with hand beater until fluffy. Stir in milk, potatoes, Bisquick, onions and salt. Melt 1 tablespoon of the butter in 12-inch nonstick skillet over medium heat. Using 1/4 cup potato mixture for each pancake, place 8 mounds into skillet. Flatten each with spatula to about 4 inches in diameter. Cook pancakes about 3 to 4 minutes on each side or until golden brown. Remove from skillet; cover to keep warm. Repeat with remaining tablespoon butter and potato mixture. Add additional butter as needed to prevent sticking. 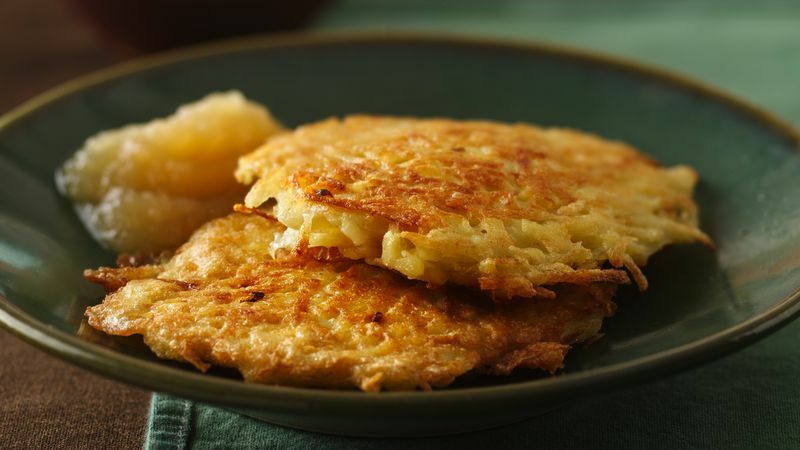 If desired, substitute 1/2 cup each shredded carrot (or sweet potato) and parnsip for 1 cup of the shredded hash brown potatoes.